Hi can anyone advise me how much is a fair price to buy please. The registration doesn't register in valuation searches for here or honest John. 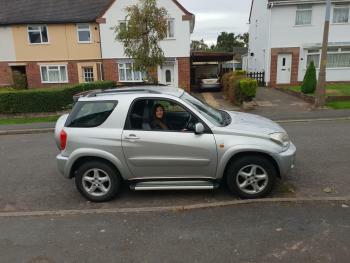 2003 Rav 4 it has done 75000 miles and has full toyota service history. My worry is no recent repairs have been identified but as things do generally wear out I'm a bit concerned repairs or worn out parts may be due for replacement. It's a 2 litre petrol seems really nice condition. Only minor fails in the past - wipers, tyres, chip on windscreen and similar. Thanks Frosty I had no idea how to check that. The paperwork does seem very legitimate. I'm wondering about the price a fair price for both the seller and myself the buyer as it is an old friend of my fiancee. I wondered if as it was a demo model that is why the reg doesn't register in price check websites. I tried Honest John and Auto Trader. My reason for buying this car is mainly it's easy to get in and out as I have a painful scoliosis and it's also a really cute car. I called Evans Halshaw they valued it for them to buy at £1100. Clearly that must be way below the value. I wondered if anyone can guide me what to ask my mechanic to check tonight. On starting it was a little smoky coming out of the exhaust but I am guessing that could be just because it had been sat for a couple of days I didntvwant and stare at it for more than a couple of seconds though. Auto Trader will give you a valuation if you put in the full details - make, model etc. etc. Guessing the pieces that you haven't given, such as trim level and exact date of registration, gives a figure of £2,100 for a private sale; £2,590 - £2,860 from a dealer. I'd be inclined to get a price from another company, such as WBAC (We Buy Any Car) and use that and the price from Evans Halshaw as a basis to talk around a figure with the seller. Bear in mind that it is 15 year old car, and you don't want to overpay, but will need to make an allowance for the vehicle condition, etc. 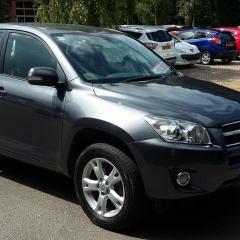 Thank you so much for all your help so here is the specification RAV 4 VVti 2 litre. DECL/D manual 2003 registered Oct 2003. I just sat a fair price between the seller and buyer as a private sale. The MOT and service are due in January. So I don't want it for super cheap price just a fair price between my fiancee and his friend from school. However I think as I will want to get it full service and a new MOT when I buy it I don't know how much is a fair price. Evans and WBAC are quoting 1100 pounds it's way off what I'm expecting to pay. Thank you for your rough figures. Philip42h does this help more or still tie in with your figures? I really do appreciate your help please consider fair for both seller and buyer, we are all pretty nice normal people with no car buying selling experience. Our friend is very kindly bring the car to my mechanic tonight to check it over. I could sense nothing wrong when I drove around the block last night. In a word, 'no' ... 🙂 The outstanding question is trim level - is it an XT2 or an XT3? (I think that those are the trim options available at that time). In both cases I've assumed that it is a 2003-2006 model year car - i.e. new rather than old stock when it was first sold in October 2003. The value will be somewhat less if it is an earlier 2000-2003 model year car. You do need to check for yourself. The Autotrader valuation site is here. There are, obviously different prices depending on whether you are buying or selling. Evans and WBAC are giving trade-in prices which are the absolute minimum that a seller can expect to receive. The car will then be turned around and sold through a dealer with some form of warranty at around £2,000 more. Hi Jammacat. I just looked on a website for car's local to where I live, bear in mind i'm across the water from you, and an 05 2.0vvti xt3 ,75000 miles. is £3300 At a dealer with three month warranty. Ur we jeep is two year's older than that and very nice to, but it is 15 year's old. I can't guess a price because I think prices must be stronger were u are from. But do check the underside for corrosion around the area above the rear wheels - the chassis leg's. My 04 two door Rav had serious rust, ie rotten. Small miles also. Just a word of caution. Good luck. Thank you Ant-Rav, yes there was some surface corrosion it was inspected up on garage ramp raise up thingy wotsits. At 15 years my mechanic said it's as good as any you'll see of that age, need to coat it before the weather turns and hope to get a few years out of it, so I bought it. No major corrosion anywhere. A little was taken off the price. I think we were both okay with it. The seller was genuinely sad to sell, having loved it for many years. It drives like cream on cream it reminds me of the best holiday I ever had in St Lucia bombing around in my first experience of a RAV. I love it so much. My mechanic is one of a kind very intelligent and honest. A professional application of Waxoyl is probably your best bet for that. Yes waxoyl is well known but I have seen some not rate it so well (then prep and application is vital to get right) been looking at Dinitrol and my mechanic rates Tetroseal. The prep is the key, I'm wishing I was able to do it myself as I want a sterling job. I expect to do something yearly to keep it up. A whole new post me thinks! Depends what you mean by very rusty underneath. The underside of many older Rav's often look bad but this is often due to rust on suspension parts which are heavy gauge metal and won't come to much harm if high pressure water jetted from time to time. Rust in floor panels etc is more serious and needs cleaning off and treating before applying rustproofing. Professional application is always better than DIY attempts unless you've got access to a lift, steam cleaner and compressed air - and it's an unpleasant and dirty job. The choice of rustproofing compound is secondary to the degree of preparation and method of application. There are many rustproofing centres in the UK and rustproofing is also carried out by many specialists in classic cars. A full rustproofing service would comprise an initial inspection - removal of plastic guards etc - a steam clean to remove loose rust, flaking paint and unsound sealant - rust treatment of identified areas - masking off of exhaust, rubber parts etc - cavity wax injection and underside application of rustproofing compound. Ballpark of £500 for the above but obviously less if you just wanted the underside treated. An inspection every couple of years is recommended when any identified areas can be touched in. - rear brake backplates can rot away and these are an eye watering £600+ each plus labour to replace (dealer only parts!). It's acceptable to remove corroded disc shields but significant corrosion of the main backplate is an MOT fail. It's worth cleaning and treating the backplates before they get too bad. - the fuel filler pipe is behind a plastic shield which gets filled with mud which eventually leads to corrosion failure of the fuel pipe. Remove the guard, clean off, treat rust and apply rustproofing. - the solid brake pipes running the length of the car and which connect to the flexibles for the RH and LH rear brakes are prone to corrosion of the last few inches where there is no protective plastic coating. This is a favourite MOT failure. It's sometimes possible to join in a new section of pipe - otherwise the fuel tank needs to be lowered to replace the pipe! Clean and rustproof the unprotected sections of brake pipe (a liberal coating of heavy grease is fine). Sorry I didn't see these and started a new thread like a silly wallly!!! So I have just seen your spectacular replies thanks for tagging me Philip. GJNorthill I really appreciate the comprehensive break down and I shall aim to find someone to do this next summer. For my recent booked in wire brush and coat I don't imagine they will be doing any of that. Is there anything I should ask them to do just for this winter in terms of places to ensure coated or parts to be removed to get to places to spray that are most essential. It's an £80 quote for a wire brush and waxoyl I don't mind to get it washed and dry beforehand myself and pay a bit more for this winter.